Many of you have asked for information on ways to exercise and get toned, and this 30 Day Plank Challenge is one of the most popular trends at the moment thanks to social media. Here’s all the information you need to get started. Plank exercises are a popular element of isometric training, which involves contracting your muscles against stationary resistance. It will stabilise your core, work your upper and lower abs, your obliques, lower back and thighs. It is hard, it works your entire body, but the results are noticeable! The full core is the toughest place to work, yet it’s where weight goes on quicker than anywhere else for most people. Simply holding your body in a plank position for a certain length of time per day, every day. 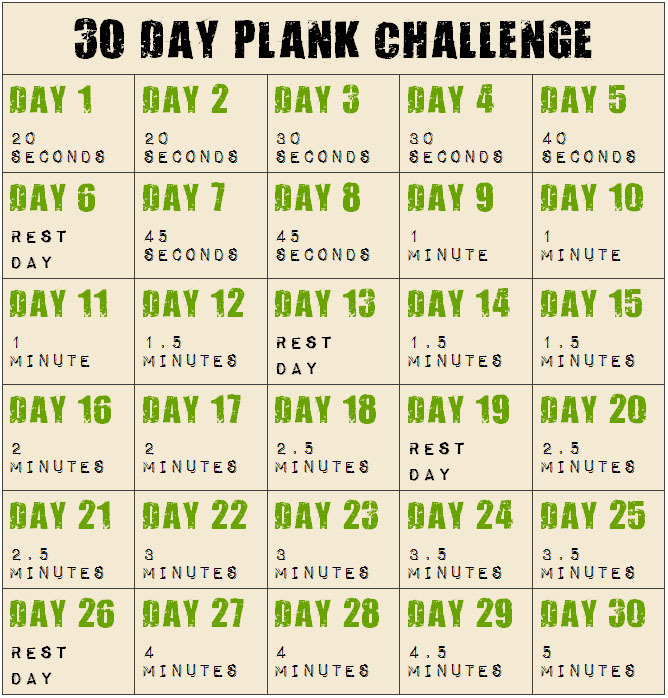 The 30 Day Plank Challenge is designed to take you from 20 seconds all the way up to five minutes. You start on day one at 20 seconds, and work your way through 30 days of slight increases (don’t worry, there are rest days). To make the 30 Day Plank Challenge effective, you’ll need to make sure you’re doing it correctly. The easiest way to stop your hips dipping or your bottom being too high is to keep your elbows in, hands flat and head down. RELATED: The 30 Day Squat Challenge.